If you are making content management system like Joomla or WordPress than you might having noticed that you can upload with full size and later you can adjust the display size with the help of that website backend but while doing all these things forces web browsers to execute multiple commands which will pull up the initial images and then will resize them on the go which may slow down your website. For preventing these things you can use image editing program to adjust the images to correct size before adding them in to your website. Many of us do access to a simple tool e.g. Preview on Mac or even Microsoft Paint on Windows and with these programs you have to open the image & re-size it in your choice of editor. Once you’ve done with this, than you can take your image editing to the next level with a compression tool and even after re-sizing each image the total file size might be pretty large & this will slow down your site’s loading speed. One of the best tools which is available online is “TinyPNG” and all you have to do is to click the link and then upload your re-sized image & this tool will reduce the file size without reducing the resolution and after that you can download the image and upload it to your site. After doing this your images will look the same and will be getting loaded much faster. There is huge number of plugins & scripts are freely available today in makes and its tempting for website owners to add more than they truly need. you should only keep those plugins which is required and not all. Ask yourself if the functionality you gain is worth the trade-off in site speed before adding any new plugins to your site or whether the plugins content could be coded into your site’s theme instead. If you believe it could be running much more effectively or if you notice your site is running slowly perform a plug-in run-through. After you disable a plug-in , one by one this involves you disabling every plugins on your site and run your site through a tool like GT Matrix which will show you the speed of your website. After deactivating a plug-in if you find that the speed of your site greatly increases then you have found your culprit and if you absolutely require that specific plugins functionality for your site to work then experiment till you find another plug-in that does not affect the speed of your site. More the plugins your site has active at any given time & then more likely their code may conflict & cause them to not work properly. Depending on the e-commerce platform or CMS your site uses, you may need to check back regularly to determine whether new releases of your site’s scripts are available. If its available then upgrade your site as soon as possible and make sure that you have a current backup file in place first. For future releases, site script developers are always working on improving their code particularly when it comes to site speed. If your website is running on WordPress then you will find these updates within the Updates tab of your WordPress dashboard. your site will install the latest software updates after click on it. You do not need for anything else on your end to do. Content Delivery Networks (CDNs) are big networks of servers that are housed around the world. Typically your users will have to access your web host’s server at its central location if you’re not using a CDN. 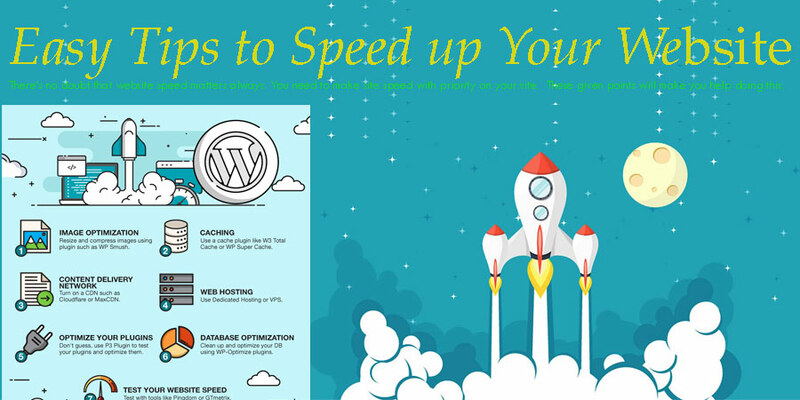 Especially if your visitors are located far away from the central location of your server then this can lead to slow site speeds and if you are only using a single server then there is a chance that it could get overloaded and cause your site to crash. By letting your users access a cached version of your site from the web host that is closest to them , CDN’s solve both of these problems but better yet is if one of your server locations is overloaded in that case they can be switched to a new server location which will result faster load times that will make your customers & the search engines happy. To store copies of your site’s individual pages Browser, caching is a technology that allows a website visitor’s browser so that when the visitor returns in the future then content can be called up from within the cache rather than reloading the whole page. To display your pages this saves the number of resources used which will be resulting in faster overall load times for your visitor. 1. You must have to navigate to your site’s Dashboard and then Plugins Add New and search for W3 Total Cache then click Install and then Activate. 2. Navigated to the new Performance tab at the top or left-hand side once the plug-in is activated. This is the place where you will control all of the features of the plug-in. The size of browser-based HTTP responses – sometimes can be minimized by as much as 70%. By Gzip compression .By using Gzip compression you can speed up your site’s load times significantly. For WordPress, Install a Gzip compression plug-in like the W3 Total Cache tool.